Sounds great. We are located in the CORAL SPRINGS/COCONUT CREEK/MARGATE AREA. ALL PICK UP WILL BE DONE IN PUBLIC PLACE. Allow 24hrs notice before coming by to pick up your item. This has the CDM-2 transport and dual TDA1540P DAC ICs. Drawer was sticking, I lubed it and it seems to work OK now but may act up. Plays fine. Sounds excellent. Acoustic Research HT380 50 Ft. Flat Speaker Wire Mounting Tape (2 - 25ft. x 1/4") in the package Ideal for mounting Flat Speaker Wire to walls, baseboards, moldings, around doors or windows and under carpet. Foam backing for versatility of installation surfaces Strong adhesive bonds to most clean surfaces 2 Rolls -25 ft. x 1/4" each. Connect any HDMI device to your HDTV or A/V receiver with ease. This mid-length six-foot cable is great for short runs between racks or from a rack to your HDTV. 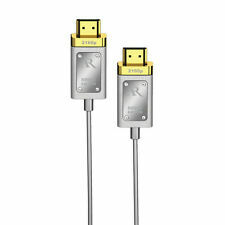 24k gold-plated, precision-molded HDMI connectors provide enhanced picture and sound by lowering signal resistance and keeping connections corrosion free. Note: Turntable and tonearm in the photos are for illustration purposes only. However, I am a Jelco dealer. Take the performance of your classic mid-80s AR the Turntable, ES-1, or EB-101 to the next level by adding a contemporary arm with contemporary wiring. AR TSW410 / AR TSW410A / AR TSW410B Speaker Foam Repair Kit. Two high quality foam surround rings for AR TSW-410, TSW-410A, or TSW-410B woofers. Two high quality foam surround rings for AR TSW-410, TSW-410A, or TSW-410B midrange drivers. (this is the original Tweeter) All HO Line, 312HO, 310HO, 308HO, 208HO, 206HO, CS25HO, P315HO. (original used a foam cone) All HI-Res, AR1, AR3, AR5, AR7, AR9, AR11, AR15, AR17, AR2C, ARC4. These speakers are 43 years old and now good as new again. Ar eb101. Condition is Used. Shipped with This is a nice clean turntable I have had for about 30 years, it has never been abused and I have been the only person who has operated it, it comes with a dust cover which is from a pioneer it covers but does not attach to the hinges. Acoustic Research AR MS271 6 ft Master Series Digital Coaxial Cable MSRP $60.00 Powerful, High-performance subwoofer interconnect and y-Adapter with 1 female and 2 male RCA's with percision-machined locking RCA connectors deliver deep, tight bass by correctly presenting low frequency signals for maximum impact. AR's exclusive FNT technology provides the most comprehensive advanced protection against noise and interference Frequency Corrected >99. Factory Acoustic Research Speaker Woofer Part # 12100032. These speakers are 43 years old and now good as new again. Re-installing the woofer was a 5 minute process and the sound was great. Best wishes. AR9LS / AR9LSI Foam Surround Repair Kit. Two high quality foam surround rings for AR-9LS or AR-9LSI woofers. Two high quality foam surround rings for AR-9LS or AR-9LSI mid-bass woofers. Two high quality foam surround rings for AR-9LS or AR-9LSI midrange drivers. 470MHz-860MHz Outdoor Antenna For DVBT2 HDTV ISDBT ATSC High Gain Signal Strong Outdoor TV Antenna. UHF channel 21-69 with flat gain through the entire band. Working Frequency: UHF, 470-860Mhz. Low noise and high gain. Sealed ACOUSTIC RESEARCH PROSERIES II FLAT SPEAKER CABLE 16 Gauge 2 Conductor 50 Feet. Condition is New. No cords to hide with this set. Excellent sound with a 300’ range, each speaker has a 4” woofer and 1” tweeter. You can also switch from L/R and adjust the sounds with this set. HSU RESEARCH STF-2 Subwoofer. Excellent Condition. Inputs Line Level (1), Speaker Level (2). Phase 0°/180°. Crossover Slope 24 dB/Oct. Crossover 30 - 90 Hz, Bypassable. AR2 / AR2AX / AR2X Speaker Foam Surround Repair Kit. Two high quality foam surround rings for AR-2, AR-2AX or AR-2X woofers. perfect for speaker restoration. Premium non-toxic, non-flammable adhesive. Just wanted you to know after purchasing and installing foam for the sub and center of my Paradigm system, speakers sound great again! Can Simply Speakers help?. Getting the old glue off was the hardest part of the job and the most consuming. Tested, in very good used condition with minimal wear from use. In NEW condition. Sold as is. 8" Woofer 4 Ohm DVC. 8" DVC Woofer. Premium Acoustic Research Woofer. 8" Dual Voice Coil Sub Woofer One Acoustic Research 8" Dual Voice Coil Sub-Woofer. Butyl Rubber Surround for Long Cone Travel. 1 1/2" Voice Coil. Acoustic Research AR MS280 3 ft Master Series Digital Optical Cable MSRP $50.00 Precision engineered fiber optic cable meets the high bit-stream transfer requirements of digital audio/video systems for clear, accurate sound that is true to the source material. AR Master series employees technologies in cable engineering, construction and materials to specifically address the requirements of current and anticipated equipment standards in order to achieve the manufacturer's intended level of performance. One Cerwin Vega Sub Woofer Cross Over( Sub crossover point is just above 200 Hz. ). 8" Dual Voice Coil Sub Woofer One Acoustic Research 8" Dual Voice Coil Sub-Woofer. 8" Sub-Woofer Speaker Kit. The kit consists of. 8" GRAY, ANGLE CONE EDGE ATTACH FSK-8. This would cause the system not to send a signal to the horn. Test the horn by hooking it up directly outside the speaker cabinet atLOW POWER. If it works you will need to test the fuse, bulb or crossover components and repair or replace them as needed. Acoustic Research AR MS253 25 ft Master Series Sub-Woofer Cable MSRP $99.00 Powerful, High-performance subwoofer interconnect and y-Adapter with 1 female and 2 male RCA's with percision-machined locking RCA connectors deliver deep, tight bass by correctly presenting low frequency signals for maximum impact. AR's exclusive FNT technology provides the most comprehensive advanced protection against noise and interference Precisely extruded precious silver coating over very fine multi-stranded >99. New-Edge-It Foam Kits by Size. 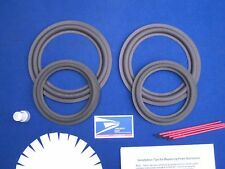 6.5" Speaker Foam Repair New-Edge-It ® Kit, Part # FSK-6.5. I have just finished replacing the foam surround on one of my two 11" woofers. The video instructions have been unusually helpful, especially the hints to apply adhesive to the back side of the foam before turning it over and attaching it to the cone. Acoustic Research 16 gauge 100' (30.4m) speaker wire with 8 high performance gold plated pins. Performance Series. 100% of our proceeds go to helping those in need. AR98LS Foam Surround Repair Kit. Two high quality foam surround rings for AR-98LS woofers. perfect for speaker restoration. Two high quality foam surrounds rings for AR-98LS midrange drivers. Premium non-toxic, non-flammable adhesive. Acoustic Research HT160 Pro Series RCA to RCA Audio/Video Cable 3 Feet 0.9m NEW! Part Numbers: HT160. 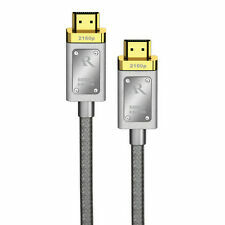 Acoustic Research AR HT160 3 ft High Performance Series Audio/Video Cable. High Quality, 3 in 1 design for neat, convenient hookup of stereo audio / video inputs or outputs. Twisted-pair audio conductors reduce interference. New-Edge-It Foam Kits by Size. 8" Speaker Foam Repair New-Edge-It ® Kit, Part # FSK-8. 8" GRAY, ANGLE CONE EDGE ATTACH FSK-8. I have just finished replacing the foam surround on one of my two 11" woofers. Acoustic Research HT362 High Definition Pure Copper AR Home Theater Pro Series High Performance Flat Design Speaker Cable with Gold Plated Pins 50 Feet of 16 Gauge with Paintable jacket. Gold Plated Pin Connectors have a set screw to attach the Copper Wire to. These Gold Plated Pin Connectors Fit into most receiver / amplifier speaker connectors for a good clean connection and sound transfer. 66 Strand of Pure Copper for each wire make this Flat Cable easy to work with and hard to kink. This cable is 6 feet in length. (No Phono inputs) This has been in my main rig for a few years replacing a ARC LS15 which used 6922 tubes. It also features a full function remote. Serial Number 15201709. Full info and Specs here.